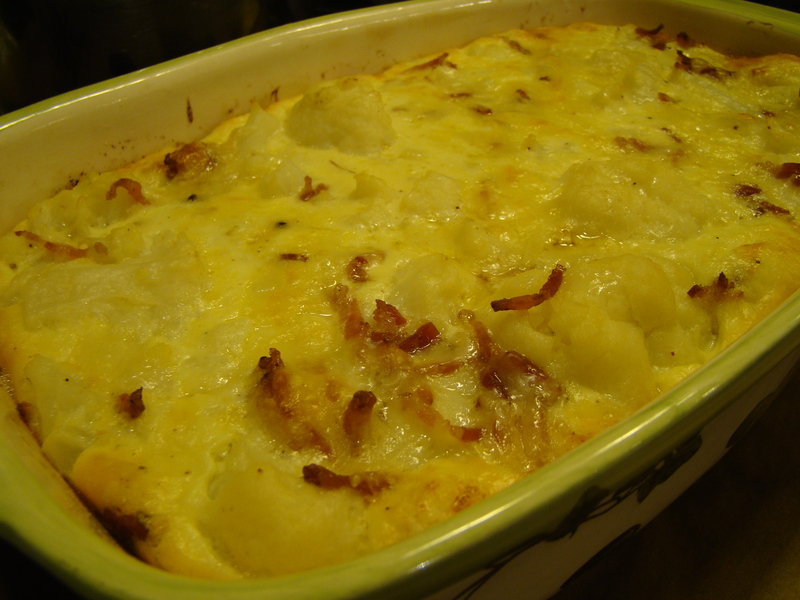 The last French Fridays with Dorie recipe for 2011 was a clear winner at our house: Cauliflower-Bacon Gratin. I got a new oven earlier this week, and this was the inaugural dish baked in the oven. I struggle to like both cauliflower and broccoli, but I’m getting there. This dish definitely paves the way. What’s not to like about anything cooked with bacon and custard and cheese? The gratin is sort of like a crustless quiche, but a little more substantial. The cauliflower is meltingly tender. The custard that holds it all together is creamy, and I love Gruyere cheese. Dorie suggested the gratin could be served as a main dish or a side. I opted to serve it as an entrée with a green salad on the side. It warmed our insides and filled our bellies. 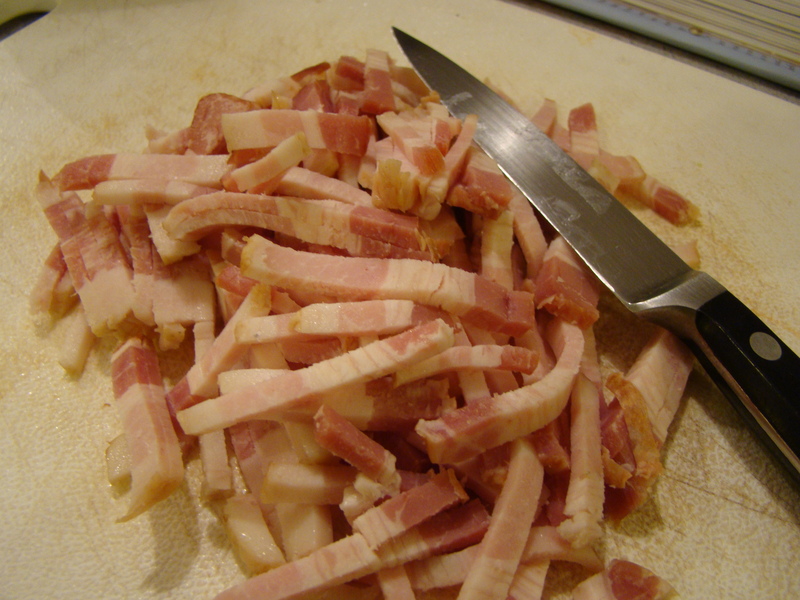 I agree it would be a nice complement to a simple preparation of meat or chicken. Leftovers held up well too. When I was making this, I was a little frustrated because it called for a cauliflower, but there was no guidance about its recommended weight. 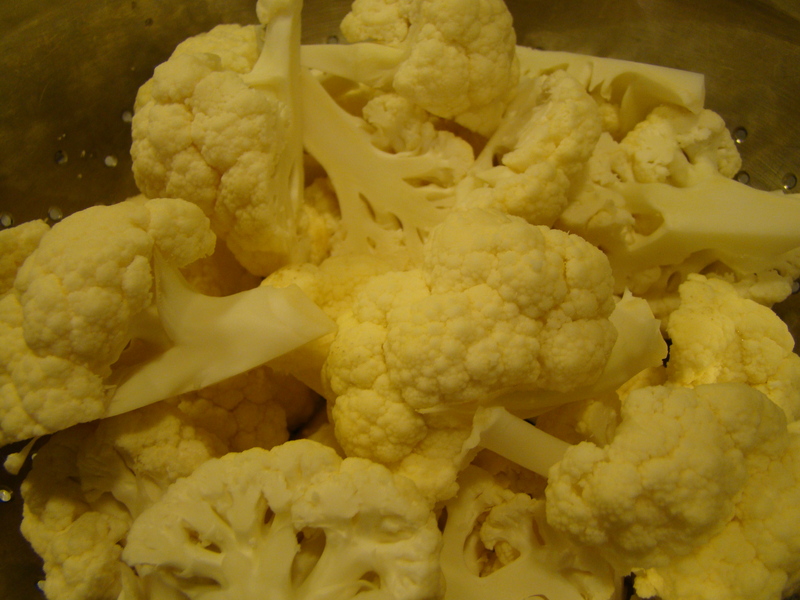 Also, it called for the cauliflower to be broken into florets, but not their size. I had two different cauliflowers in the refrigerator, one twice as big as the other. I used the bigger one, but some of the florets were huge. I ended up quartering the giant ones. In the end, I realized that none of my anxiety mattered. I know it would have worked out fine with a bigger or smaller cauliflower and a bigger or smaller florets. The gratin is quite forgiving. You can read about their gratins too by following the links on the FFwD site. 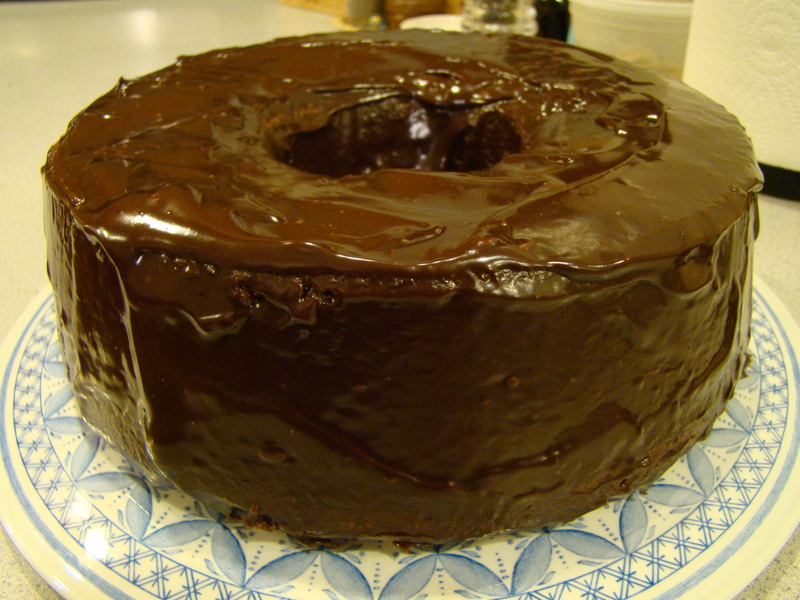 We are asked not to post the recipes, but I found it posted here on Leite’s Culinaria. That doesn’t mean that if you find Dorie’s recipes appealing, you shouldn’t get yourself a copy of Around My French Table. Happy New Year 2012 to all my cooking friends! It’s been a great year getting to know you all and sharing a passion for the kitchen with you. For many years, Howard and I have made it a tradition of taking off from work for the last week of the year. Typically, we don’t go anywhere. Instead, we spend the week on various housekeeping projects and other things we didn’t get around to finishing during the year. We also take time to do something fun everyday. For the most part, my doings this week aren’t interesting enough to tell about in detail. However, here are some highlights. They say that friends are the family you choose for yourself. We shared Christmas celebrations with good, long-time friends who live nearby. The best was the Feast of 7 Fishes on Christmas Eve. Every morning, after breakfast, I go for a walk with Howard and Bella in the woods. It’s my favorite walk. The woods look different in each season, and it’s very quiet and peaceful there. It’s also the only place where Bella is allowed off-leash. She loves the freedom to explore the terrain, at the same time, never letting us out of her sight. We ate at two of my favorite casual eateries: All Star Sandwich Bar in Cambridge and Sweet Cheeks Q in Boston. All Star has great sandwiches (obviously from the name). The menu includes both classic sandwiches as well as more creative combinations. They also have amazing French fries. They’re hand cut and skinny and served piping hot, with lots crispy bits. I had one of the daily specials, an ALT, avocado, lettuce and tomato, served along with grilled onions and melted Jack cheese as a panini. Yum! Howard had a pastrami Reuben, which he enjoyed. I don’t eat sauerkraut, so I didn’t try it out. Sweet Cheeks Q is a new barbeque restaurant near Fenway Park. Their brisket can’t be beat, but we’ve also tried the pork belly, pulled pork, and ribs. It’s all exceptional. For a family with a genuine Texas smoker in our backyard, we know what we’re talking about. The sides are outstanding as well. I’m crazy about the Farm Salad made with seared Brussels sprouts, candied hazelnuts, and grapes, among other ingredients. The cheesy broccoli casserole is also worth writing home about. My home office has gotten to the point where it lacked any semblance of organization. I made a dent in the chaos. I managed to discard 8 to 10 bundles of unread magazines in time for the week’s curbside recycling. There’s more, but it made a noticeable difference. Nearby Watertown is home to some excellent Armenian markets. One morning, we went on a mini-shopping spree. Spinach pie, eetch (a sort of tomato-infused tabouli), and stuffed grape leaves made for a delicious feast for lunch. I don’t know why we don’t shop in that neighborhood more often. Our annual latke dinner for Hanukkah. 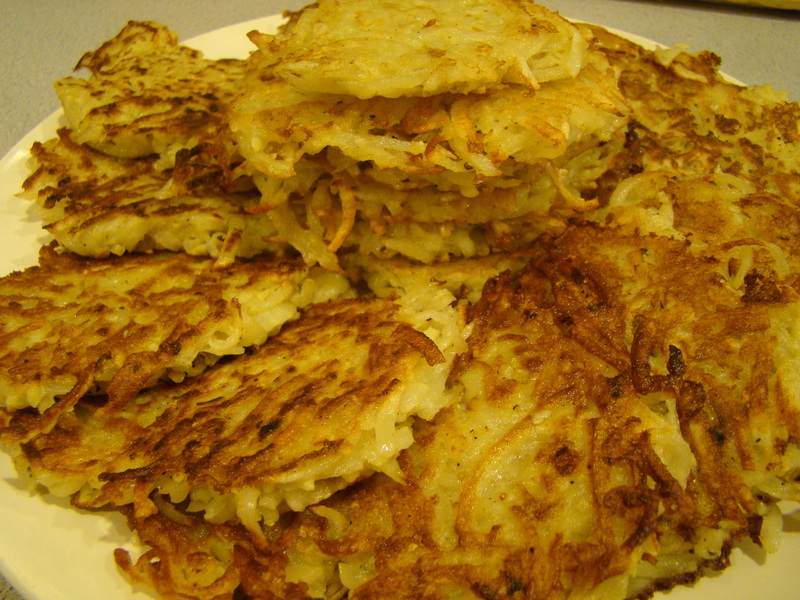 I didn’t get around to making any applesauce, but we enjoyed that pile of potato pancakes with sour cream. They came out really well this year. The downside is that the house smells like oil for days, but it’s worth it. My oven started acting up right before Thanksgiving. Well, it had some electrical problems over the summer, where the control panel stopped displaying, but Howard managed to fix that. More recently, a poltergeist took up residence in the oven and started locking and unlocking it while it was off. Kind of creepy, especially because the only time the oven usually locks is when it goes into self-cleaning mode. 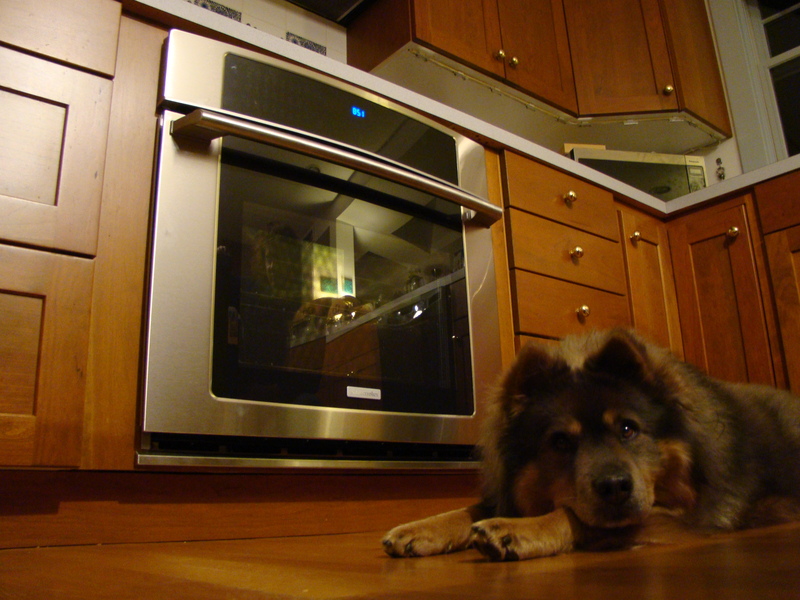 Howard removed the latch, but the oven’s days were definitely numbered. End of story: I had a new oven installed this week. Yay! I know, it isn’t everyone’s idea of a thrilling vacation, but I’ll definitely end the year with a feeling of accomplishment! The week isn’t over yet. I don’t go back to work until Tuesday. There are a few more days and more projects on the list and more adventures too. Stay tuned.